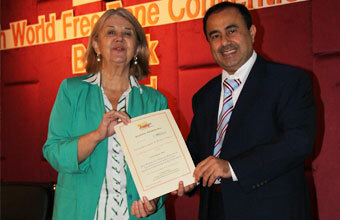 The Fourteenth Session of the World Free Zone Convention granted SEZAD the Internal Website Award. This followed an assessment carried out by the conference organizing company for the websites of participating economic authorities and zones. It pointed out that it granted SEZAD this award in recognition of the richness of its website, which gives the investor a clear idea of ​​ the characteristic investment environment and available projects in SEZD. It indicated that the continuous updating of news and tenders and providing footage materials and publications on the website help attract investors. Muhammad bin Ahmad Al-Shezawi, Director of Awareness and Media at SEZAD and editor in chief of Duqm Economist Journal, received the award. This award shed light on the investment in SEZD in one of the specialized international conferences in the field of economic and free zones attended by representatives from 21 countries. The conference, held in Bangkok, Thailand, from 27 February to 1 March, reviewed the global economic trends that affect economic zones with regard to free trade agreements and their impact on economic zones and investment trends. It also touched upon the importance of geographical location, industries in economic zones, and importance and feasibility of investment in border free zones. The conference also touched on foreign direct investment and its relationship to the growth and development of economic zones and financing and development of infrastructure to attract more investments, along with the gains achieved by the economic zones that enjoy diversity in the areas of investment and have ports and airports. The conference sought to highlight the customs regulations used in economic zones, and touched on the gains achieved by the logistics there, the opportunities available in this sector and the challenges it faces, and how to exploit the site to connect a company's services between its targeted local and foreign markets.